I ♥ E-Poetry welcomes its new contributor, Nohelia Meza. 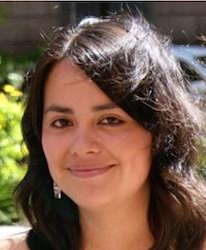 Nohelia Meza is a PhD candidate at the Department of Translation and Language Sciences, Universitat Pompeu Fabra, Barcelona. She holds a BA in English from the National Autonomous University of Mexico (UNAM), a MA in Audiovisual Translation from the University of Seville, and a MA in Teaching Spanish as a Foreign Language from the University of Deusto and the University of Iceland. Her PhD project focuses on the poetics of digital discourse and the rhetoric of time in specific works of electronic literature. She is also interested in translating e-lit works into Spanish, as well as, in teaching Spanish as a Foreign Language using electronic literature. Nohelia is a member of Hermeneia research group (Literary Studies and Digital Technologies, Universitat de Barcelona), Red Latinoamericana de Literatura Electrónica; and a collaborator of the publishing group at Centro de Cultura Digital México. She is fascinated by volcanoes and adores pencils, and if she could be restored to factory settings she would not think twice about studying Astrophysics.